In the HR and management world, we often discuss employee engagement — how to improve it, the detriments of low employee engagement levels and the difference an engaged workforce can have on a business’ bottom line. This is all important information we need to know, but an often overlooked (but nevertheless critical) part of the process is how we can actually engage employees before their very first day on the job. This is particularly important when you consider employee turnover — it’s not uncommon to see a 22% new employee attrition rate within the first 45 days. Engaging your employees before day one will go a long way to reducing your voluntary turnover. So how do you encourage your top new recruits to retain their level of excitement following a job offer? This can be particularly difficult if the notice period is long. If there is little to no communication between your company and your new recruit, it’s very possible their enthusiasm will start to dwindle and disappear altogether. To ensure your employees remain interested, informed, and enthusiastic about their new workplace, here are a few simple but effective ways you can engage your employees before they even get their name badge. Have the CEO welcome the new recruit with a personalized hello message — The CEO plays an important role when it comes to employee engagement. Leaders represent the company, so when an employee knows the CEO, they feel they know and understand the business all the better. Increasingly, employees want to work for companies with good values and ethics — they also want their leaders to embody these ethics. If your new employees don’t hear anything from your CEO and simply regard them as a nameless, faceless, and personality-less entity, they will ultimately feel less involved in the business. To get things off on the right foot, share a personalized welcome from the CEO and create a sense of connection with your new recruits. This can be followed up with a one-on-one catch up in their first week. Assemble an induction plan and a welcome pack — Pre-boarding is essential when engaging a new employee. This involves an onboarding plan for an employee — including how they will be spending their first day on the job. This plan helps employees focus on their jobs while allowing them to build valuable workplace relationships. To keep your employees excited and to allay any nerves, create an induction and welcome pack for them. This will let them know you are thinking of them and planning for their arrival while demystifying their new role. Include names and email addresses of people they will be in regular contact with so they can contact them before their first day if they want. Make sure to include a handbook, giving information about your organization, and detailing your values and culture. Include a copy of your business newsletter and invite them to any upcoming social activities, which will give them an opportunity to meet their new colleagues and develop relationships early. Engage your new recruits on social media — Once your candidate has handed in their notice and is being vocal about their new job opportunity on social media, start to invite them to your social networks and engage them in conversation. This is a quick and effective way of ensuring your new recruits are in-tune and connected with the goings-on of your company. Make your company values visible and transparent — As we mentioned above, employees love to join organizations that have deeply-held values. They also like businesses with values that align with their own. 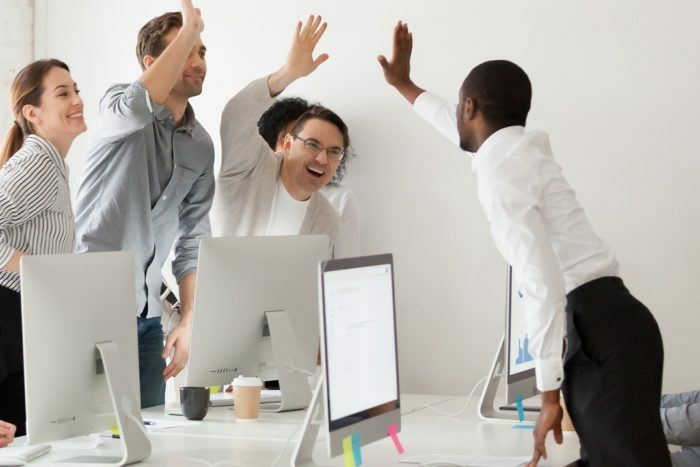 For this reason, in terms of early engagement and ongoing employee engagement efforts, you should make sure your company values and culture are evident and transparent on your website and on social media. You can even send them a video highlighting your organizational culture. You can interview current employees about their experience at your company, discuss everyday workplace activities, and share what you do in terms of fun social activities. This is a great way to get your employees excited about their first day and to encourage a feeling of belonging. Invite employees to join your Slack channel — If you use a group communication tool such as Slack, consider setting your new recruits up on this platform early, inviting them to various channels. This will encourage social interaction and it will also give them a good idea as to the inner workings of your company. Stuart Hearn is a leading performance management specialist who has been working in the HR sector for over 20 years. He is passionate about moving performance management forward and is currently CEO of Clear Review, an innovative performance management software system. He previously worked for Sony Music Publishing and was a co-founder of PlusHR.